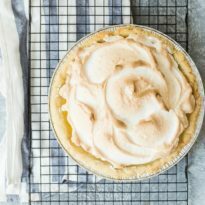 Light and heavenly, meringue is little more than egg whites and sugar, whipped into clouds of pure delight and gently baked. Billows of it can be used to top a pie, but it’s equally wonderful on its own, too, piped into cookies, kisses, cakes, and nests for fresh fruit. To prepare a basic meringue, separate the egg whites and place in a glass or metal bowl (plastic bowls can have a greasy film that prevents foaming). Try to separate the eggs without leaving any trace of yolk in the whites as the fat in the yolk can prevent the whites from developing the volume you want. Add the lemon juice and using an egg beater, beat the egg whites until frothy. They should form what's called soft peaks. Peaks are the "hills" that pull up when removing the beaters from the foam. You'll know your peaks are soft when the tips gently fall over. Gradually add the sugar, 1-2 tablespoons at a time until it is all incorporated and the peaks become glossy. Continue beating until the foam forms stiff peaks and all of the sugar has been dissolved. To test if the sugar has dissolved, rub the beaten meringue between your thumb and forefinger. If it feels gritty beat the eggs a few more seconds until smooth. Pile your meringue onto your warm dessert and bake 425˚ F (218°C) for about 4 to 5 minutes - just enough to gently brown the peaks. For a hard meringue, such as toffee kisses, you'll need to double the recipe above, and add a 1/4 teaspoon cream of tartar before ou add the sugar. Beat the eggs white until they form stiff, glossy peaks. Fold in 1 teaspoon of vanilla. Preheat your oven to 275˚ F (135°C). Pipe or dollop the egg whites onto a parchment lined baking sheet, and bake until firm- about 30 minutes. Cool on wire rack before serving. Store cooled meringues in an airtight container for 1 week or wrap well and freeze up to 1 month.